With all the hoopla surrounding the Metropolitan Opera in HD, it is easy to overlook that there are other games in town. Since last season, DigiScreen has been presenting operas and ballets from the Royal Opera House Covent Garden in selected Canadian theatres. I have seen Luisa Fernanda with Placido Domingo, and a stunning Carmen starring Ana Caterina Antonacci and Jonas Kaufmann. To be sure, these shows are not "live" like the Met - they were taped for DVD release, so it doesn't have quite the sense of occasion. There are no intermission features or interviews, for example. Still, there is something to be said about seeing it in a large screen with state-of-the-art equipment. The products from Opus Arte - a company owned by Royal Opera - are always of a very high level. Presumably, these operas will be commercially available on DVD sometime in the future. 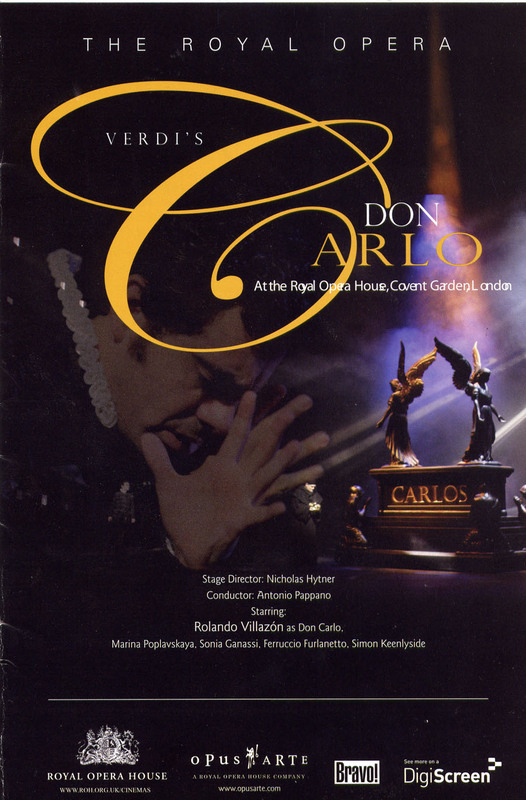 This past weekend, I attended a screening of Verdi's Don Carlo, taped at Covent Garden last June. The main interest for me was the return of Mexican tenor Rolando Villazon, who withdrew from the stage for the latter part of 2007, for reasons not entirely made clear. He came back in January-February 2008 for a few performances of Werther at the Vienna State Opera, to mixed reviews. 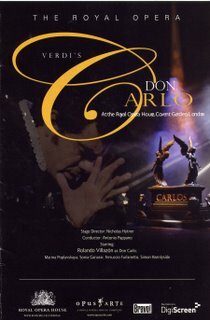 This June Don Carlo represented his first large-scale production. At the time, critical opinion was mixed - some felt he had return to form, while others felt his performance left something to be desired. It is impossible to tell at what point during the run this performance came from. Indeed it is likely that it's a composite from two or more performances. Judging from what I saw and heard, Signor Villazon is back and in great form. Granted a filmed performance isn't quite the same as experiencing it live in the opera house. For one thing, it is difficult to judge the size of the voice. Having heard him live on several occasions, I have noticed that his instrument isn't all that large, and sometimes, in big houses like the Met, it sounds like he is pushing. For what it's worth, based on this taped performance, one can't ask for a more passionate and involved Don Carlo, and vocally he was completely secure, with none of the little cracks and glitches that plagued his performances throughout most of 2006-7. His Don Carlo for Amsterdam - available on DVD - is a little neurotic, quirky, and vulnerable, in keeping with the directorial concept. His characterization here is more straight-forward and less idiosyncratic, but equally touching. He has excellent chemistry with other cast members, especially Rodrigo and Elisabetta. There is less interaction with Eboli in this production. His duets with Rodrigo and Elisabetta were real highlights of the evening. This is a new production by Nicholas Hytner which replaced the ancient Visconti production dating back to around 1958! It is darkly handsome, with an understated grandeur that is entirely appropriate in this grand piece. The direction is more mainstream and less eccentric than the Nederland Opera production. Past productions of this opera favoured an ending where Carlo is dragged into the cloister by Charles V. But this rather problematic ending has become less and less popular - most modern productions have Carlo stabbed or shot to death, like the Vienna and Barcelona productions. In the COC production, Carlo is blinded and tortured before dying, a real gruesome end. This ROH production, despite being the 5 Act version, is really the Italian Don Carlo with the Fontainbleau Scene tagged on in the beginning. It has none of the music that is found in the true French version, and there is thankfully no ballet. Still, the opera was almost four and a half hours long. With the wonderful music and superlative singing, the time went by in a flash. One unusual feature of this production is spoken dialogue between the priest and the heretics during the Auto d'afe Scene, something I had not seen previously. The ROH cast was uniformly strong. Other than Villazon, top vocal honours went to Ferruccio Furlanetto as a most impressive Philip. Simon Keenlyside was wonderful too as Rodrigo, while not erasing memories of the great Dmitri Hvorostovsky in this role. Sonia Ganassi (Eboli) took some time to warm up, and her Veil Song did not show her to advantage. But her O don fatale brought the house down as expected. American basss Eric Halfvarson made the most of his brief appearance as the Grand Inquisitor. Robert Lloyd is equally excellent as the Friar/Charles V, although the voice is starting to show its age. Russian soprano Marina Poplavskaya is a fine Elisabetta vocally, but I have to say she does not move me. There was a coolness about her, and her face remained immobile in the dramatic moments. Antonio Pappano brought out the full lyricism of the score, eliciting wonderful sounds from the Covent Garden orchestra. The success of Villazon here really makes me curious about this recent Hoffmann at Covent Garden. I spoke to a friend who attended it in November, and the report was extremely positive. Noted critic Rupert Christiansen also gave it 5 star in his review. Let's hope ROH will preserve it for posterity on DVD. Met in HD: Berlioz' Damnation of Faust Lepage-d!